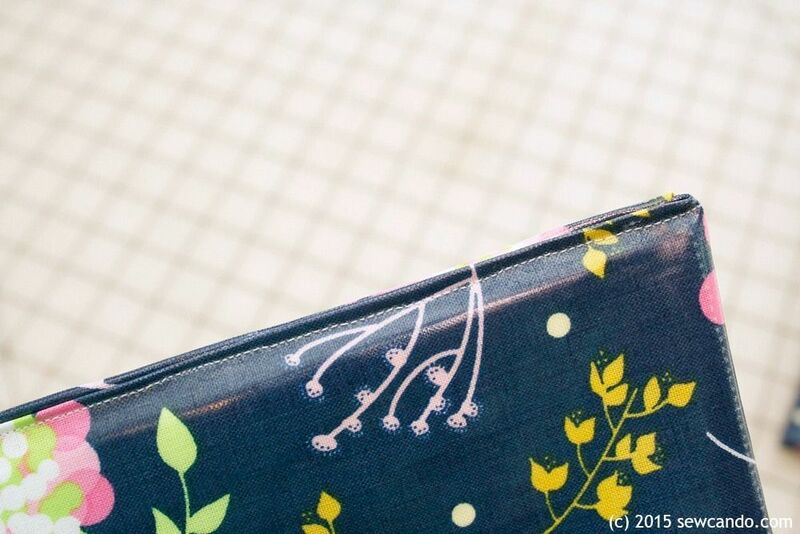 Want to make the ideal bag for summer? Something big enough to haul loads of stuff, but still fold up small? Repel water, sand and spills, inside and out, yet still look stylin'? 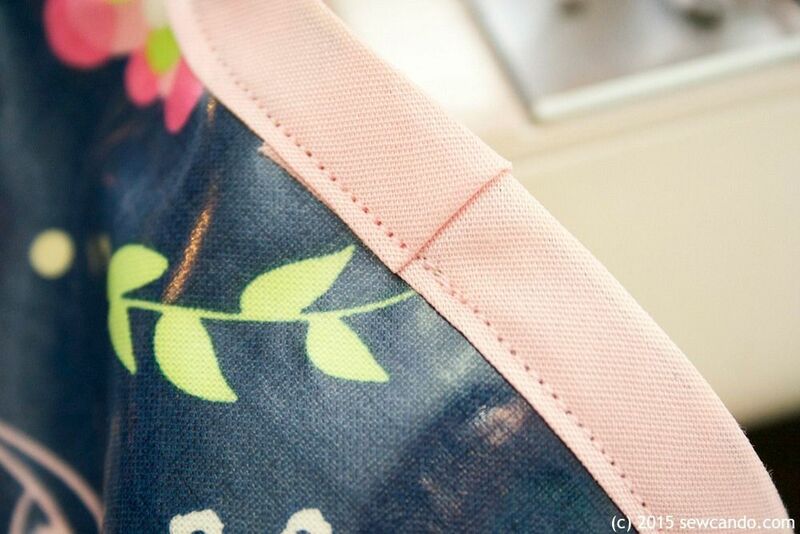 Then today's tutorial is right up your street: it's my Wonderfully Waterproof Tote Bag. 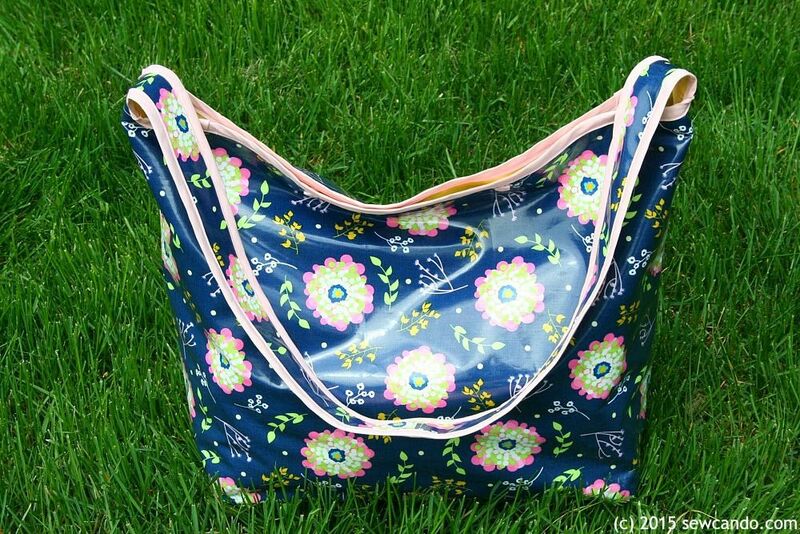 I used to sell this as part of my previous Around Town Bag PDF pattern, but now I'm offering my how-to here for FREE. 'Cause I'm nice like that;) Plus, in my new version I've also added a firm, removable base piece to help the bag retain it's shape and give extra support. 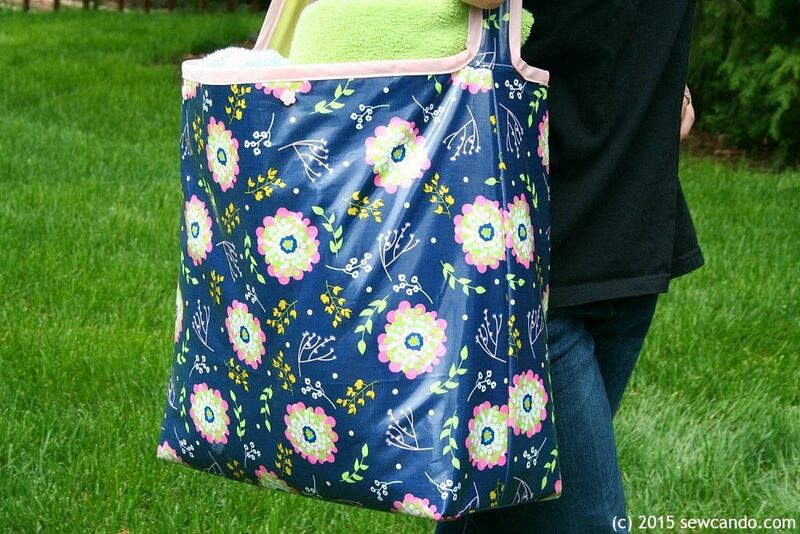 And that base is totally waterproofed, just like the bag's interior, so go ahead and toss those soggy towels & swimsuits in there - this bag don't care! - Lip balm - this makes the laminate move smoothly under the presser foot - no sticking! Got questions about Laminated Cotton? I've got more info & projects using it here. Note: Just scroll through to see 'em all since this project will come up first. PUL fabric? More info & ways to use that here. Just scroll down on that too for more PUL fun. 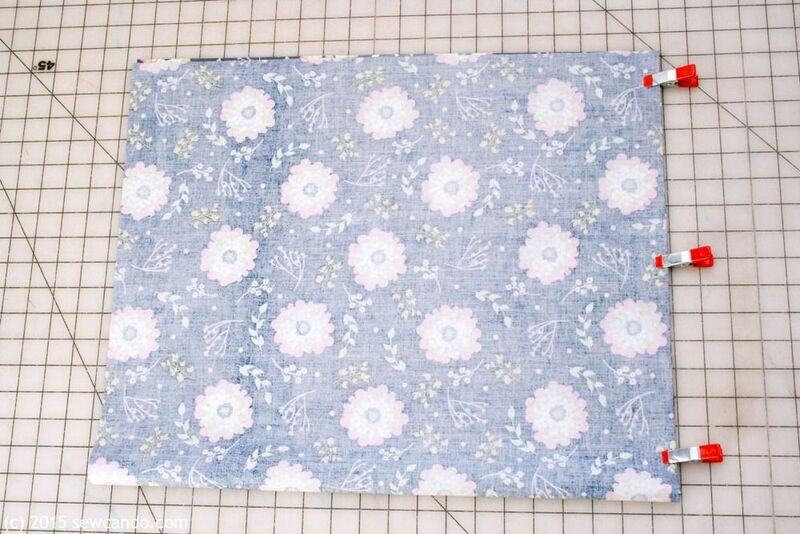 Turn the main fabric so the fold is on the bottom. 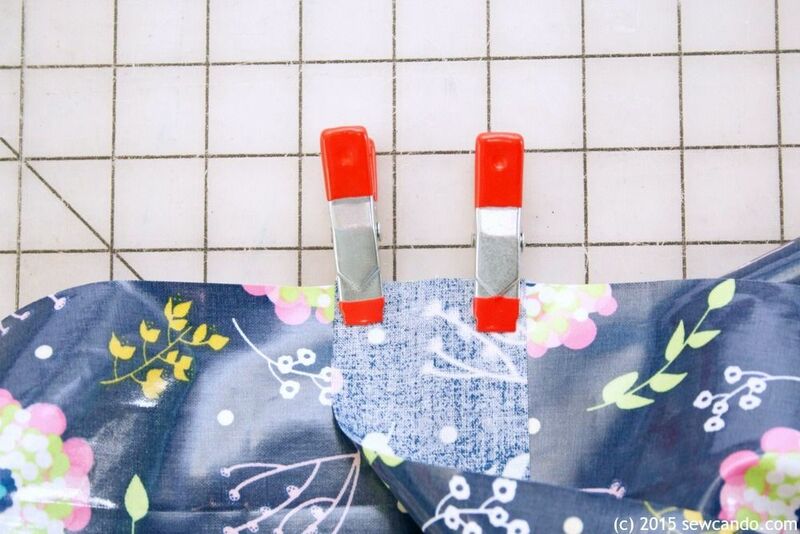 With right sides facing, clip along the sides so that the fold is on the bottom. 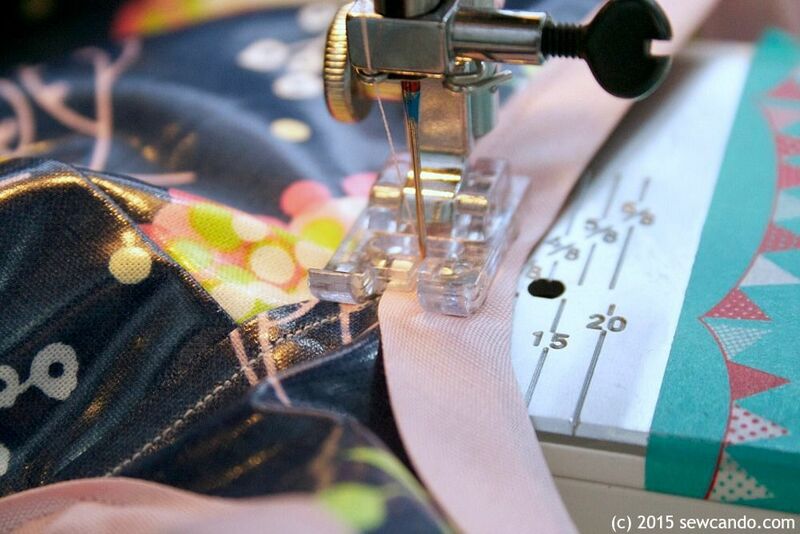 Pins are a no-no with laminated fabric, since they leave holes, so the clips are ideal. 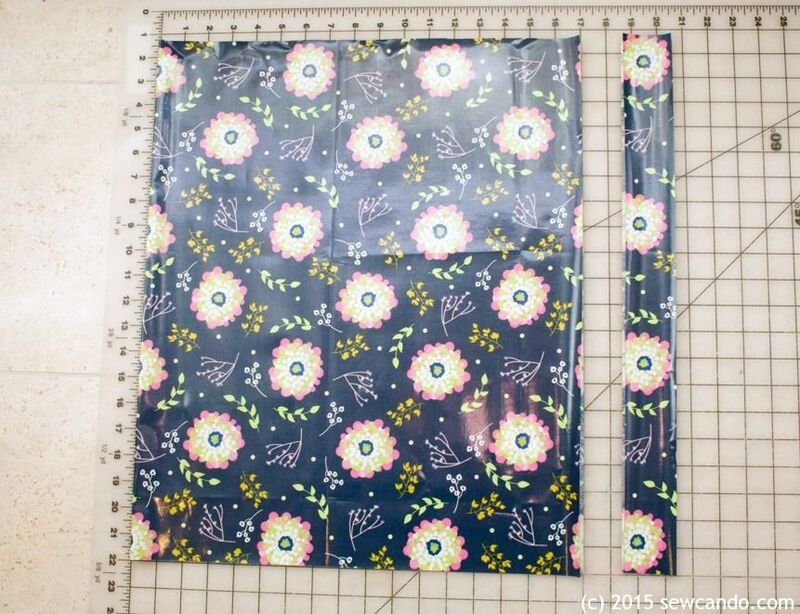 Stitch down the sides with a 1/2 inch seam allowance. 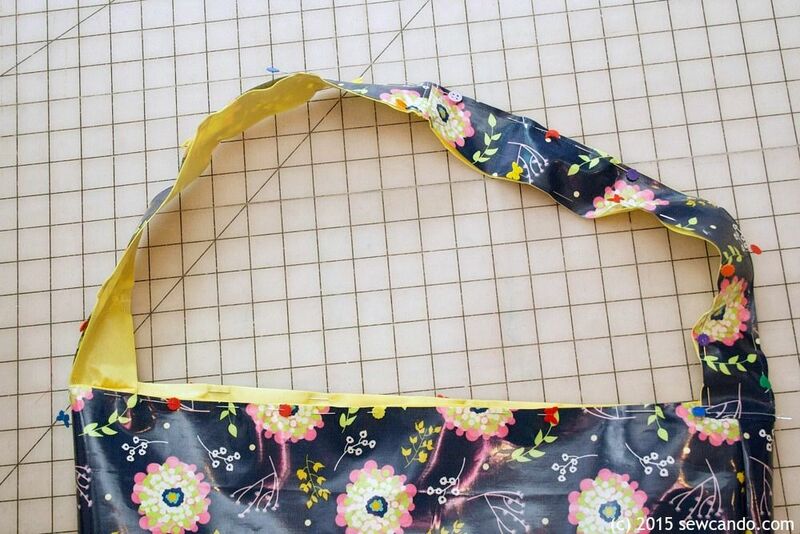 To create the wide depth of the bag, the corners need to be squared off. 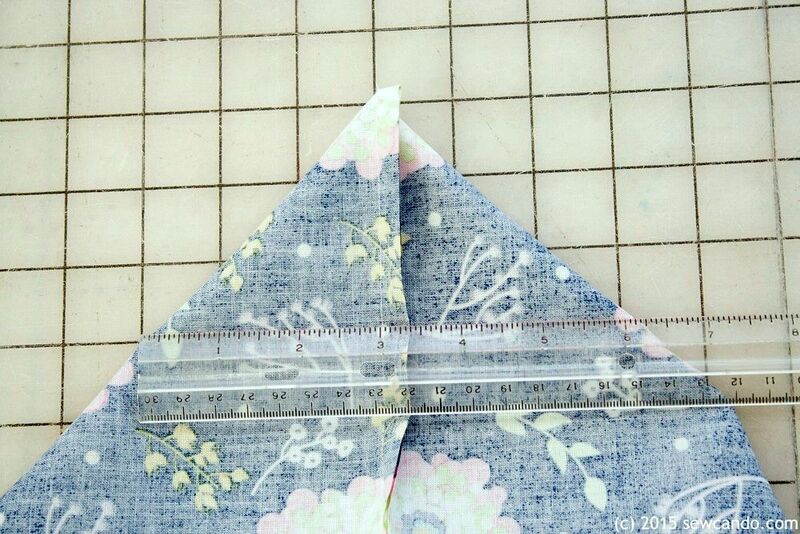 Pull each corner to a point to make a triangle and measure 6 inches across and mark. 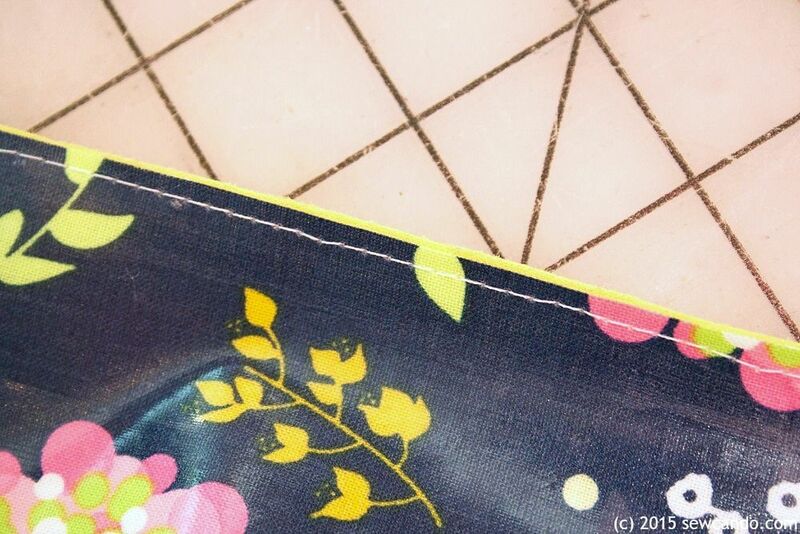 Stitch along the marking and then stitch another seam 1/4 inch away from the original for reinforcement. Trim off the excess. 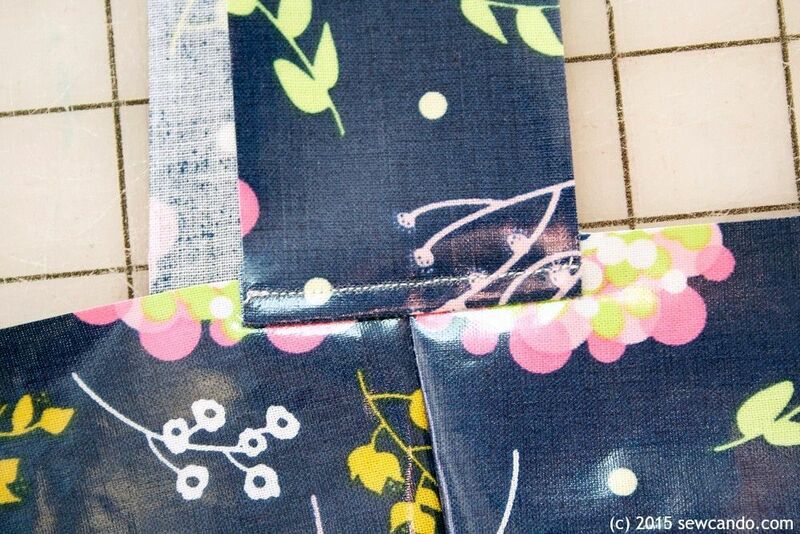 With right sides facing, match up the middle of the each end of the strap with each side seam and clip. Stitch with a 1.4 inch seam allowance. Pull strap upwards and topstitch (remember the lip balm!). Repeat on other side. Repeat all previous steps with the PUL using the shiny side as the right side. Note: If you want to add an interior pocket to the lining, this would be the time. 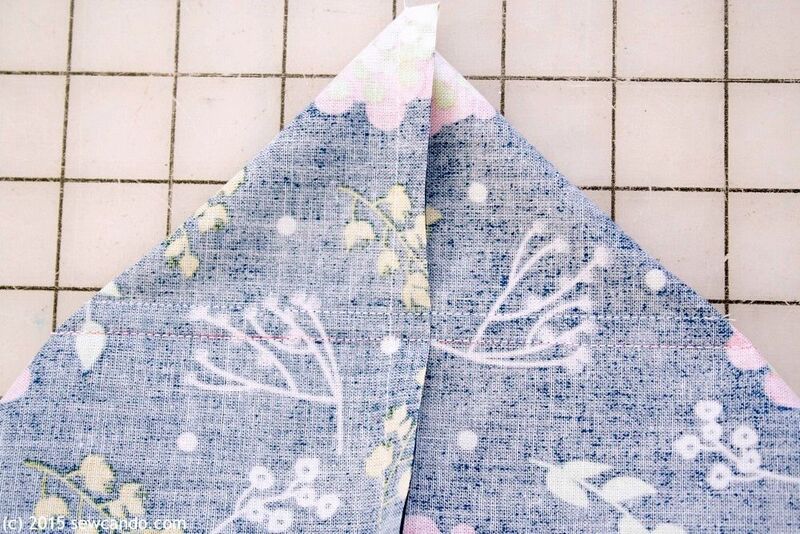 Just decide on pocket size (mine was 9 inches wide by 7 inches high when cut out), center it on a side and make a hem for the top side of the pocket, fold under the remaining sides and stitch 'em down. 3/8 inch from the tape fold. 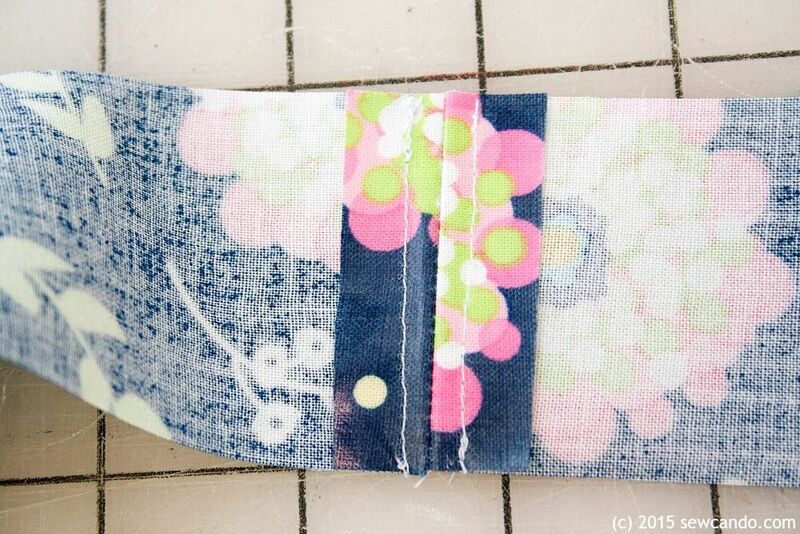 To finish, about an inch before reaching the beginning, fold open end of bias tape under and overlap on starting point and stitch into place. 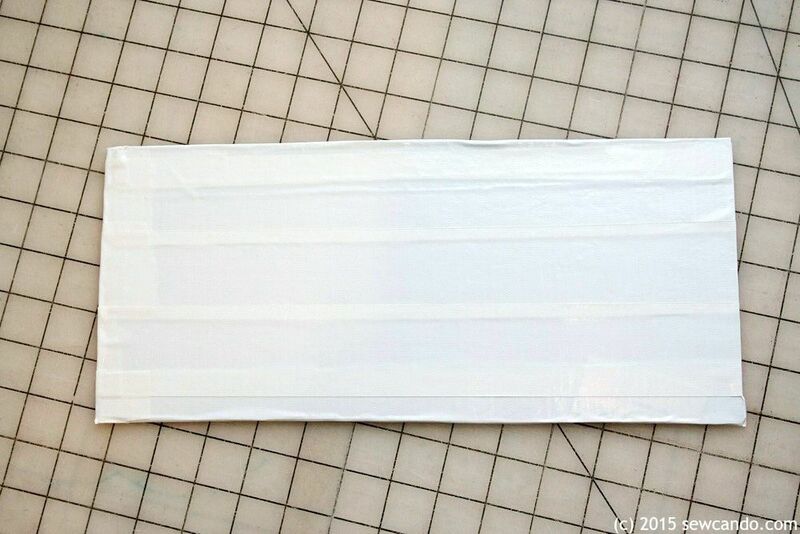 To make the bottom insert, cut a piece of laminated cotton that's 14 1/2 inches wide by 13 inches high. 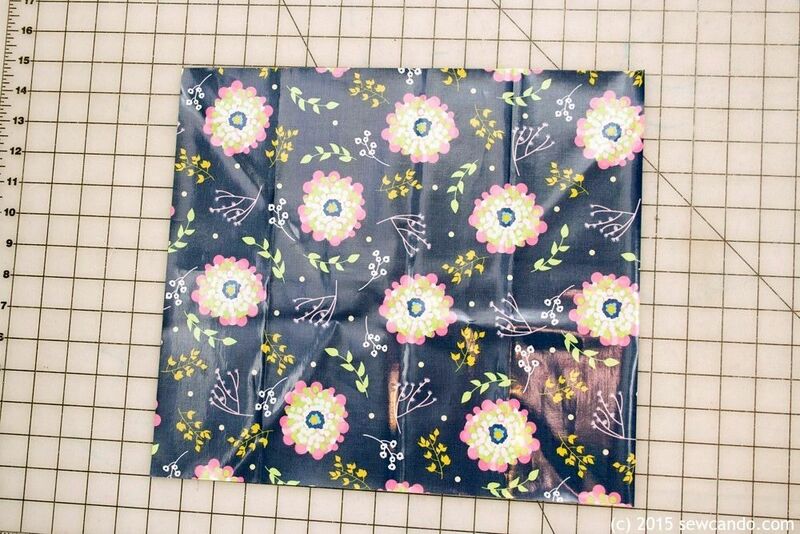 Fold fabric in half, with right sides facing, so that it's 7 1/4 inches by 6 1/2 inches and stitch along one short end and one side with a 3/8 inch seam allowance (don't want it too be too snug for the insert to fit inside). Trim raw edges & clip corners, then turn right side out. Slip cardboard into the sleeve. 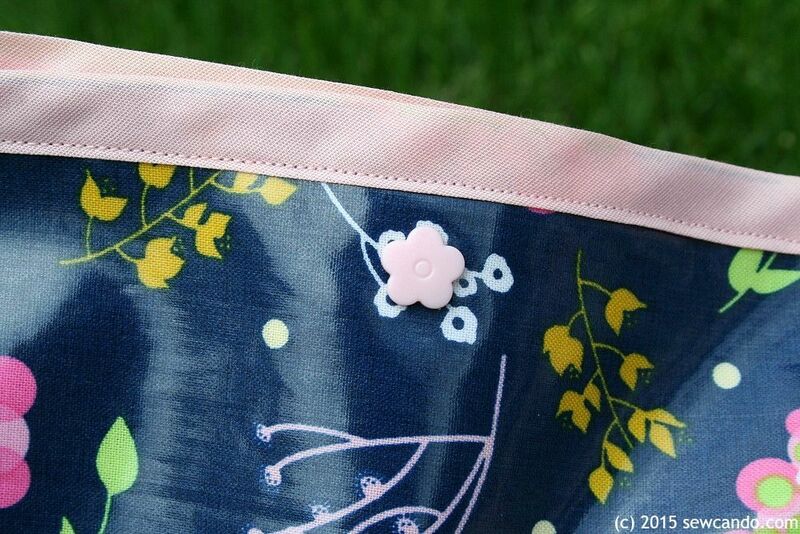 For closures, use some handy plastic snaps - these babies are super strong and ideally paired with these durable fabrics. 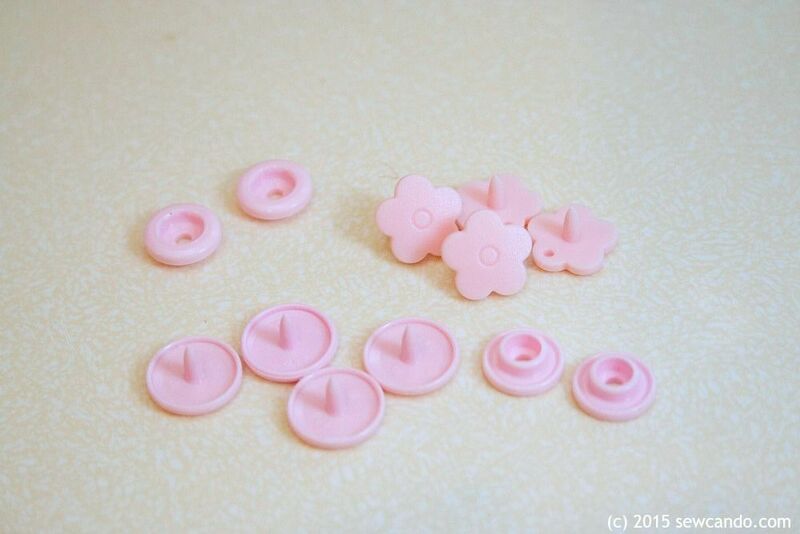 I used some cute flower shaped snaps that fit within my normal size 20 snap press. What kinds of stuff would you tote around in this bag? 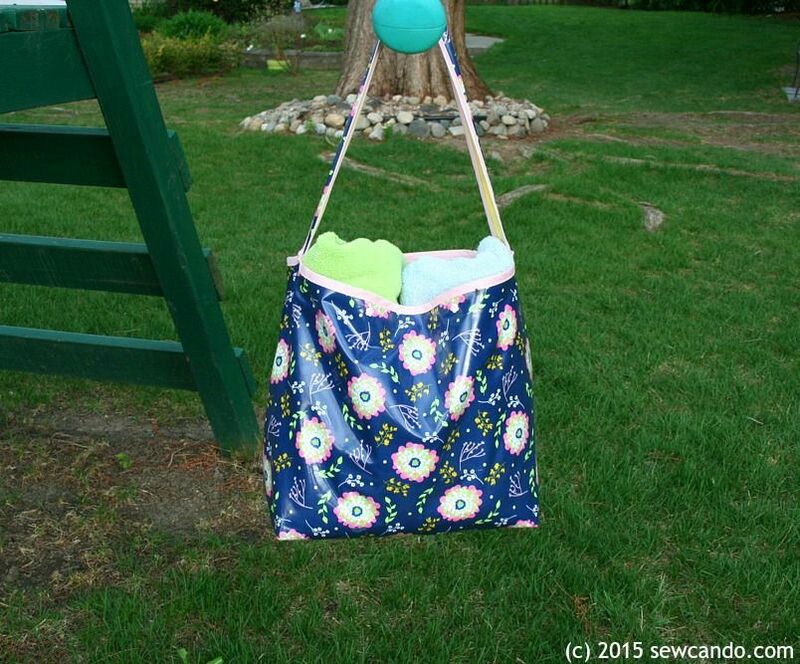 I totally need to make one of these for summer! Swimming lessons and beach trips are on our list and this would be perfect. Thanks for sharing! Glad the timing was so good! 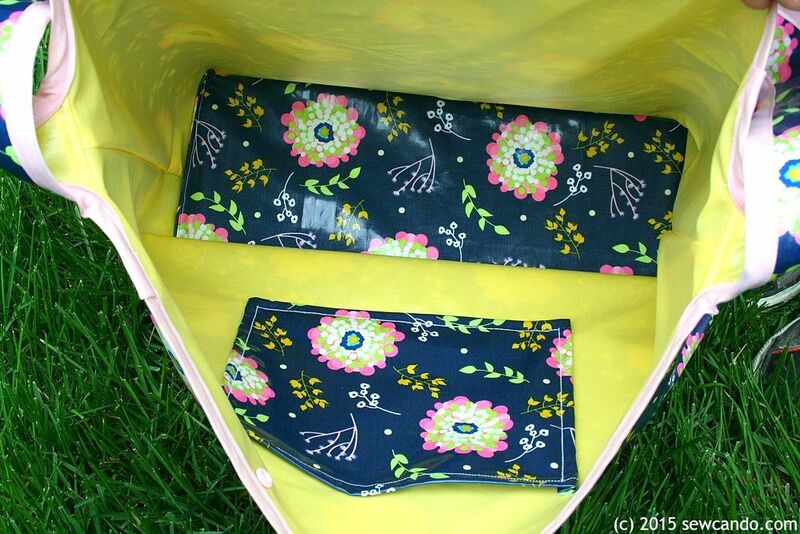 I really want to make one of these bags, but my experience with the sewing machine just isn't there yet. I'll bookmark for later, though. This is just too nice to pass on. 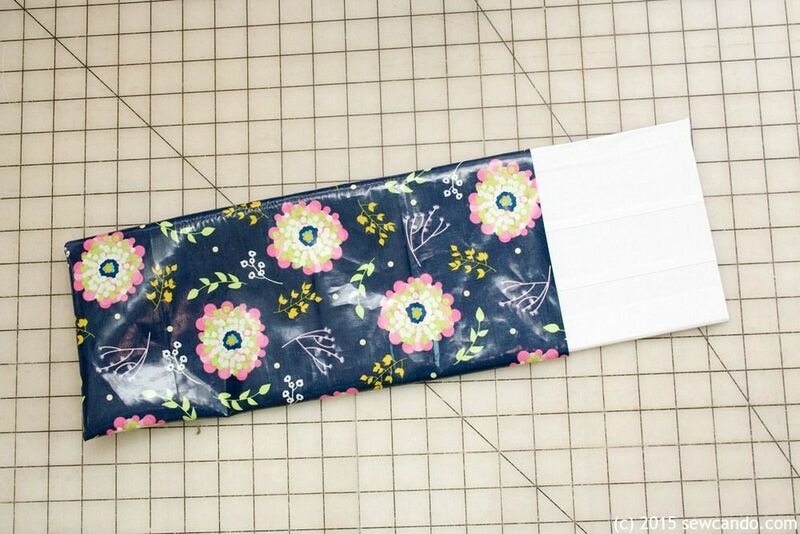 Thanks Betty and this is a simple sew, so it's great for a beginner. You'll be ready to make it in no time! I love the lip balm tip, and the pegs too! I'm making an oilcloth bag for my eldest boy so that'll come in useful! 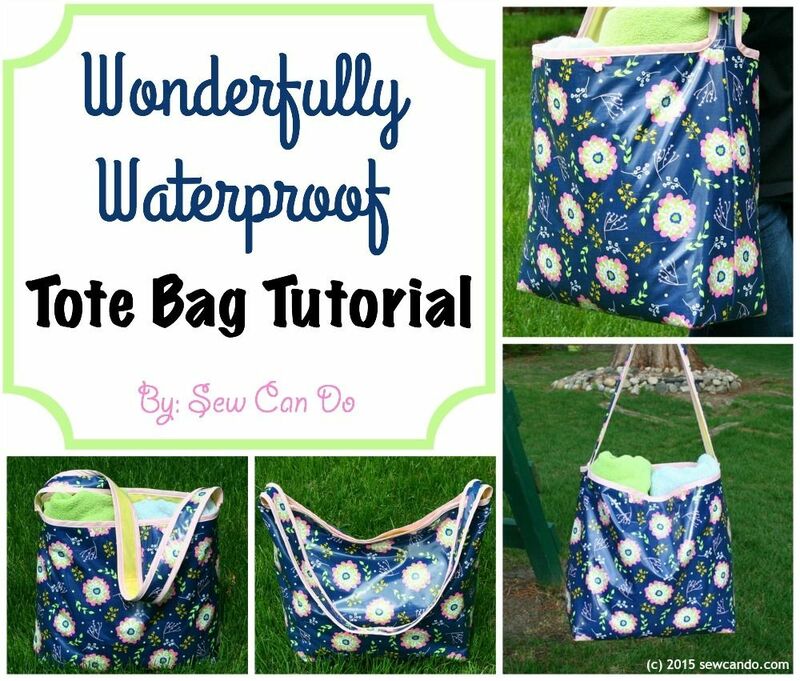 Your bag is so cute and I love that it's waterproof! I would love for you to link up at the Stitch It, Blog It, Share It Link Party going on now at behindtheseamssewing.com. Thanks for the invite Bonnie. The waterproofing on both sides makes it practically indestructible. I've linked up and added your button to my party page. Fabulous!!! 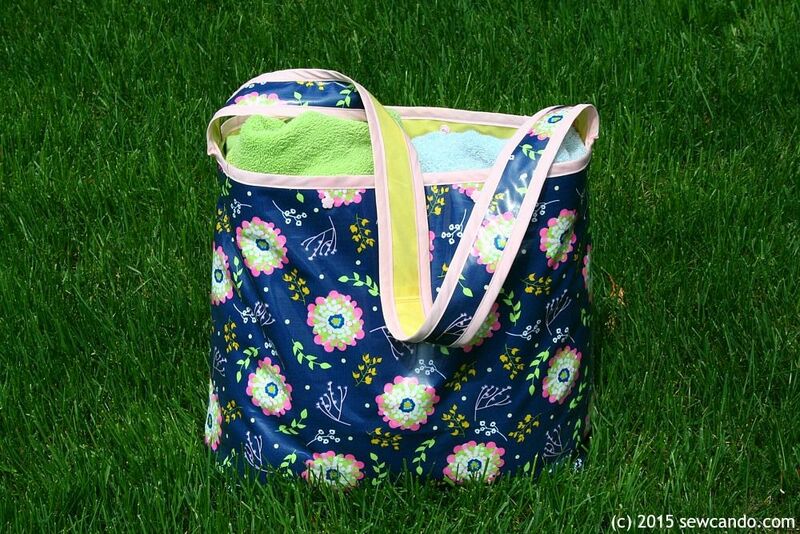 Perfect for a swimming bag thanks to the waterproof fabric inside and out. Love your choice of fabric, Cheryl. 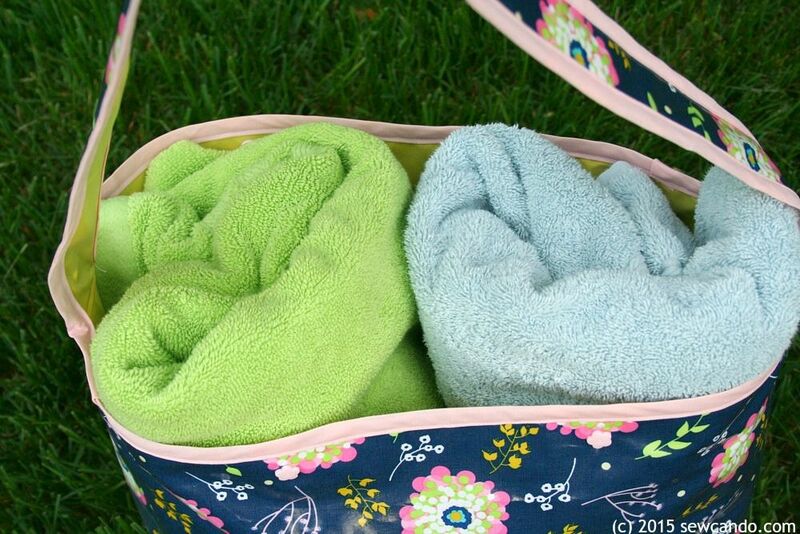 A cute bag that holds full size beach towels? I'm sold! Thanks for sharing this great tutorial at Something to Talk About! Much appreciated Karen and yes, it'll hold those giant towels, but it doesn't look or feel like one of those ridiculously oversized bags. 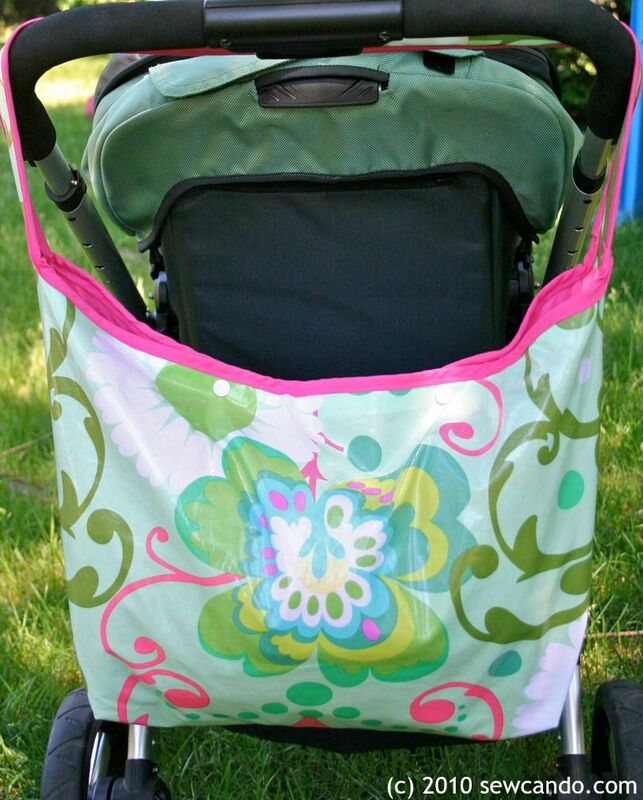 Perfect for toting around! Really nice tutorial! 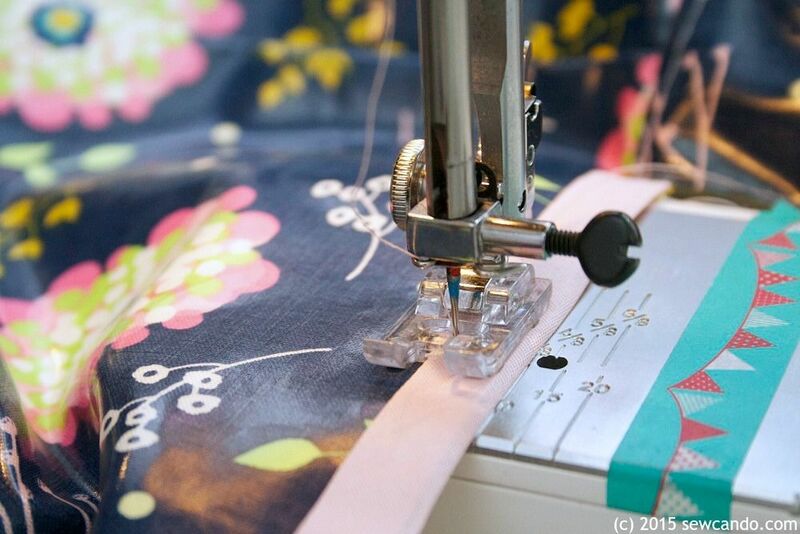 Can you do machine embroidery on the laminates? 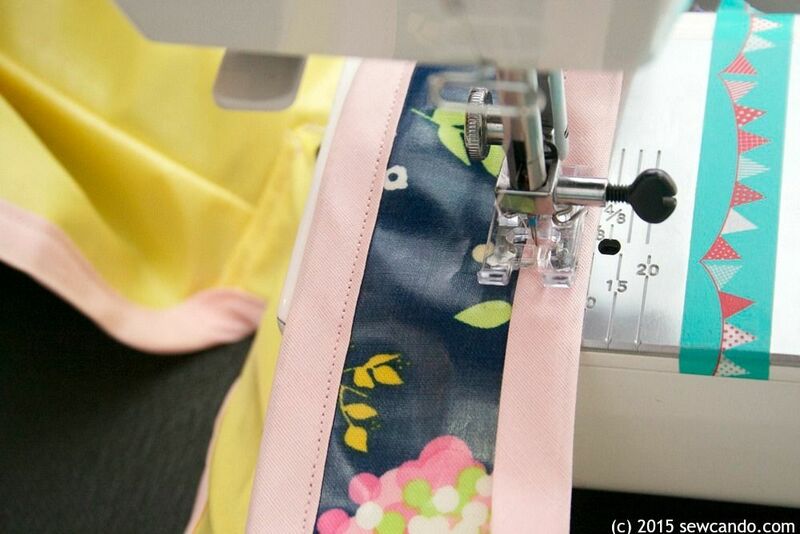 You can, you'd just need to add a pocketed liner piece behind it so the embroidery stitches won't cause leaks.